3 more days and Thanksgiving will be here! I know most of the emphasis is on the main course and desserts, but let’s not forget about the appetizers, it’s the warm up to the meal. Also let’s be honest, are you ever done cooking by the time you say you will be? I know I’m not. Every year I still need at least another 30 minutes to whip the mashed potatoes, set the table, maybe check the mirror to make sure I look presentable, etc. A 30 minute wait time with my starving loved ones pacing around me feels like an eternity and carries a lot of pressure. 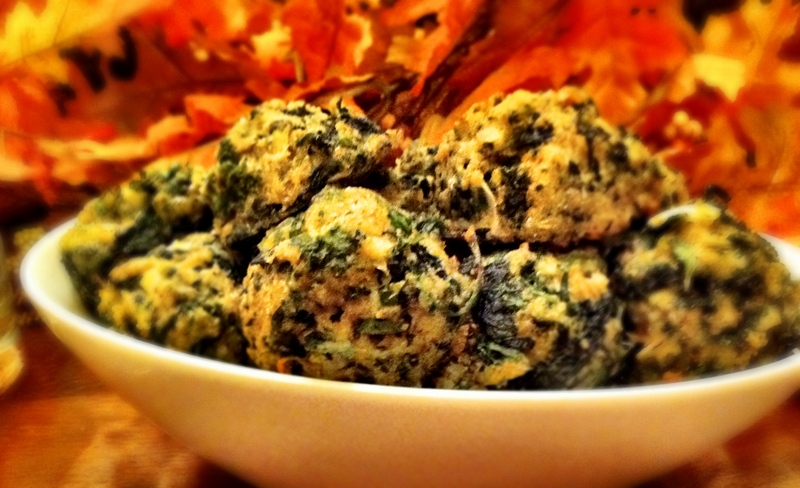 This year avoid the death stares, appease their hungry stomachs, and buy yourself a little more time by making an appetizer that packs a powerful punch like my Spinach Parmesan Poppers! I first came across this recipe when I watched an episode of the Hearty Boys on the Food Network a couple years ago. Overtime, like most recipes, I started to tweak it to my liking and came up with my own version. I hope you enjoy! Can I substitute almond flour in place of the bread crumbs and ghee in place of the butter? Thanks Amy – I will keep you posted as to how they turn out. I’m extremely excited to try these – as I was in need of one more app for Turkey Day!! !